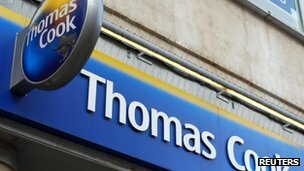 The FT says Thomas Cook’s sales fell 33% in the first 2 weeks of January compared to the same period a year earlier. This is partly as they have cut the number of holidays offered for sale. The FT says the fall at Thomas Cook is greater than that at their rival, TUI. Thomas Cook say its bookings in December were good. It plans to cut the holidays for summer 2012 on sale in Britain by 8% given weak consumer sentiment. The company has been hit by tough trading, especially in Britain, where its core customer base of families with young children is struggling in tough economic conditions. The group has 1,300 outlets, and plans to close 200 of its branches over the next two years. The airline carries around 8 million passenger per year, declining. Thomas Cook’s summer bookings by British customers were sharply lower in early January, further denting confidence in the embattled holiday operator after a string of profit warnings and a funding crunch. The Financial Times reported on Monday that Thomas Cook’s sales had fallen by 33 percent in the two weeks to January 13, citing a leisure industry monitor shared by tour operators to track bookings. Shares in Thomas Cook, which have fallen by over 90 percent in the last year, were down 3.3 percent at 14.5 pence at 1245 GMT. Shares in rival TUI Travel were down 0.8 percent at 195.2 pence. In a statement emailed to Reuters, Thomas Cook confirmed that sales had fallen but said it was down to a planned cut in holidays on sale rather than a collapse of confidence in the brand. Thomas Cook said it last reported UK bookings on December 14, showing it went into January with an order book for summer 2012 that was well ahead of the wider market. However, it also said at that time it had planned to cut the holidays for summer 2012 on sale in Britain by 8 percent given weak consumer sentiment. “Therefore, we were expecting our intake plan to be well down in January (i.e. we would be managing bookings down towards capacity, focusing on margin rather than volume,” the world’s oldest travel firm said on Monday. The comparable period last year was also boosted by an intensive promotional campaign in shops and online. Charles Stanley analyst Douglas McNeill said the latest figures were a concern, but investors should not read too much into a two-week booking period. “It would be unwise to place too much emphasis on a snapshot of trading over a very short period of time. Nor does this data square very well with the notion that customers are fretting about Thomas Cook’s solvency, given that its December bookings were relatively strong,” McNeill said. Thomas Cook issued a string of profit warnings last year, leading to the departure of chief executive Manny Fontenla-Novoa in August. In November, it had to ask its lending banks to provide a 200 million pound debt facility to see it through the winter months when bookings are at their lowest. The company has been hit by tough trading, especially in Britain, where its core customer base of families with young children is struggling in tough economic conditions. It has also been affected by unrest in popular destinations such as Egypt, Morocco and Tunisia. The airline carried 8,120,815 passengers during 2010, and operates a fleet of over 40 Boeing and Airbus aircraft during the peak summer holiday season, making it the fourth largest UK airline by passengers carried. The airline will standardise its narrow body fleet, replacing Boeing 757s with Airbus A320 family aircraft over five years beginning in 2012. Thomas Cook Airlines carried over 8.1 million passengers during 2010, a 1.0% reduction compared with 2009. Tour operator Thomas Cook has seen UK summer package holiday bookings take a steep fall, it has confirmed. Bookings have dropped by nearly 33% in the two weeks to 13 January – a key period for tour operators. But it disputed a report in the Financial Times, which said the fall reflected a lack of consumer confidence following its recent refinancing. The company said the drop reflected a cut in holiday capacity in an attempt to cut costs. The FT said the drop at Thomas Cook was nearly three times the 11% fall at Thomson Holidays owner TUI over the same period. Thomas Cook shares were down 5% in morning trading. In a statement, Thomas Cook said: “We last reported UK bookings at our results on 14 December 2011. “This showed that we were going into January with a decent mainstream order book well ahead of the market. “However, as we explained at the time, given weak consumer sentiment, we had cut our planned capacity by 8%. It added that the figures did not reflect its overseas performance or that of its specialist arms. In November, Thomas Cook’s shares plunged 75% in one day after after it said it was in talks with banks about securing extra financing. It agreed funding of £200m a few days later. The firm blamed a string of events for its financial troubles, including unrest in Egypt and Tunisia and floods in Thailand – all key destinations – for hitting sales. The group, which has 1,300 outlets, has set out a turnaround plan for the UK business, including focusing on fewer and better quality hotels and a drive for more online bookings. It also plans to close 200 of its branches over the next two years. Thomas Cook reported in its delayed final results that its UK business saw underlying profits fall 68% to £34.1m in the year after its margins slipped to just 1%. Charles Stanley analyst Douglas McNeil said the latest sales figures were a concern, but that investors should not read too much into a two-week booking period. “It would be unwise to place too much emphasis on a snapshot of trading over a very short period of time,” he said. Thomas Cook, which was one of the worst performing stocks on London markets last year, was forced to turn to its lenders in the wake of deteriorating sales. A series of profit warnings triggered the departure of its chief executive and rival TUI Travel, which owns Thomson Holidays and First Choice, said it had won business from its struggling rival as a result. Demand for foreign holidays has fallen sharply in the UK in recent months as weak consumer confidence continues to bite, Thomas Cook warned on Tuesday. The holiday group said that Britain was lagging behind other European countries, with the rate of bookings for summer trips “slowing noticeably” in the UK this year. This has forced Thomas Cook to cut the number of holidays it offers UK customers. Although the UK recession officially ended more than a year ago, consumer confidence has slumped to its lowest level in nearly two years– due in part to growing inflationary pressures and austerity cutbacks. Economists have warned that this means many “big ticket” purchases are being shelved. Thomas Cook reported on Tuesday that it has sold just 1% more holidays for summer 2011 to UK customers than at the same stage a year ago. On 8 February it told the City that bookings were 6% higher than in 2010, indicating a sales slowdown during the last two months. This followed a 5% drop in cumulative bookings from the UK for winter breaks. Trading is stronger in central Europe. Sales to Germany, Austria and Switzerland are 4% higher than a year ago. In northern Europe, including Sweden, sales of summer holidays are 11% higher. The ongoing unrest in the Middle East has also caused disruption for Thomas Cook and left it with a £20m bill. It spent £5m repatriating holidaymakers early, and also lost another £15m of potential profits due to travel restrictions. A total of 150,000 holidays to Egypt and Tunisia were cancelled. Most restrictions on flights from Europe to the Middle East and North Africa have now been lifted, and Thomas Cook reported that hoteliers are offering “attractive discounts to rebuild confidence in the area”.